At what point do ends and means come into conflict with ones such as Lance Armstrong or his obsessive Ahab-like hunter, USADA? That question surfaced again this past week with the news that Lance Armstrong had decided to give up his legal fight against the United States Anti-Doping Agency (USADA) in light of USADA’s pending arbitration hearing against the seven-time Tour de France champion for his alleged use of performance-enhancing drugs. In each case, neither side has emerged as a champion. The undeniable good that Mr. Armstrong has done for the cancer community with his Livestrong Foundation was built on the publicity generated by his seven consecutive Tour de France wins following his recovery from testicular cancer. It is arguable whether the fame, and therefore fortune, behind the Livestrong movement would have been possible without those victories. Yet notwithstanding USADA’s continued obsession to harpoon what had become its white whale, Mr. Armstrong’s capitulation last week could only be seen as an admission of guilt, no matter how he framed it. But at the same time, the Armstrong-USADA fight beggars the question, has the goodwill and cancer funding generated by his TDF titles been a worthy enough end to justify the performance-enhancing means that Armstrong all but certainly used to attain them? Which, in this case, is the lesser of two evils, especially in a culture awash in denial and deception? Now that the Olympic flame has been extinguished in London, the time has come to consider the lessons learned and to plot the road ahead. Certainly, Team U.S. A.’s track and field medal haul of 29 deserves high praise, especially given the wide swatch they cut through all disciplines and distances, sprints to distance, throws to jumps. On the far side of the track there was the modest number of distance-only medals returning to Kenya (11) based on their own high expectations. But both those evaluations and interests are parochial in nature. What of the overall place of Athletics (track & field) in the Olympic movement going forward, especially to Rio in 2016? The father of the modern Olympic movement, Baron Pierre de Coubertin, defined Olympism to include “adhering to an ideal of a higher life, to strive for perfection.” An honorable goal, but in today’s commercial world the “higher life” ideal seems more quaint and less important. For quite some time the credo of the NFL Oakland Raider founder Al Davis, “Just win, baby”, has moved to the top step of the podium. Yet in the last few days we have seen two young perfection strivers embody de Coubertin’s Olympism ideal quite movingly. First, Jamaica’s supreme sprint perfectionist Usain Bolt halted a post-race TV interview following the defense of his 100-meter title to acknowledge the U.S. national anthem being played for Sanya Richards-Ross’s 400-meter gold medal presentation across the stadium. It would have been fully understandable for the foremost Olympian in London to continue his interview. After all, it wasn’t his national anthem. 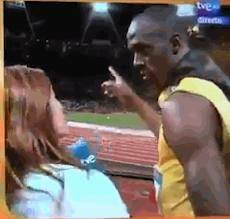 But in a totally natural expression of respect, Bolt halted the TV presenter in mid-question to turn in silence and in doing so ascended to a higher station than even his unparalleled athleticism had taken him. Next came Grenada’s 19 year-old 400-meter star Karani James, elevating both himself and his double-amputee competitor Oscar Pistorius of South Africa by exchanging Olympic bibs after Pistorius was eliminated in their semi-final race. Like Bolt, the young James – who went on to win the gold the next day – saw past the glitter of gold, and instead embraced a model of courage and dedication that he, too, strove to achieve. 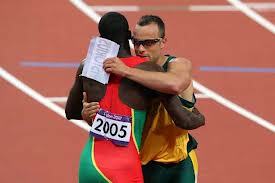 Now compare Bolt and James with Obama and Romney. Amidst their less than honorable competition for the oval office, the two cynical pols and their handlers continue to spray the airwaves with negative ads, demonize their opponent, cherry pick quotes and mislead an increasingly frustrated electorate who are simultaneously less equal in education and opportunity, and more culturally polarized as the melting pot has morphed into a salad bar of cultural bins. As we contemplate the dislocation and enmity that led to the hateful shootings at the Sikh temple in Oak Creek, Wisconsin this past weekend, we should ask our leaders whether they see their own lack of adhering to a “higher life” standard as being, even in some small way, complicit in the coarsening which contributes to such tragedies. Maybe we need a Presidential election mission, but one more along the Baron’s line than the Boss’s.